Dolvin's Technology Consulting and Finance Software Blog: Are Firewalls Really Necessary? People that have some familiarity with networking know what a Firewall is. A lot of people really do not know anything about them. 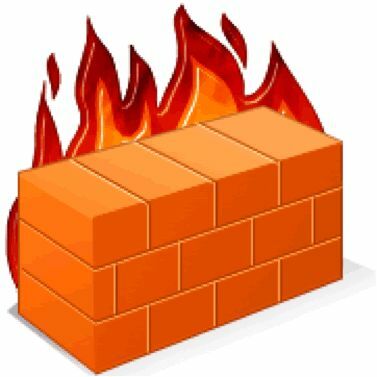 It is not unusual for me to run into people that do not know what a Firewall is or if they are using this technology. One of the great things about today’s technology providers is that they make it very easy, even for a novice, to set up networking. From a professional’s perspective, it gets frustrating. Most of us would like to see equipment and software fully configured with the maximum security when delivered. It is a lot easier to start secure and ease restrictions on trusted sources, than to try and remediate problems and make a network or computer secure after the fact. One supplier indicated that only about 40% of the people they spoke with had a firewall. And too many who do have firewalls are not monitoring them. Which means your network could be under attack or even breached, and you would not even know it. They symptoms may not be that obvious. Unprotected networks and computers have a short lifespan of productive use. It is estimated that an unprotected system connected to the Internet will be compromised (hacked) in about 20 minutes. There is more to security than just a Firewall. A Firewall can either be software or hardware. Many use both. And just like a chain is only as strong as its weakest link, so is security. There are many aspects to consider, this biggest vulnerability is people. We can be our own worst enemy at times. A Firewall is still an important part and it must be configured properly, updated and monitored to ensure it is doing the right job. So what exactly is a Firewall? As we explain this, think of “Traffic” as information or data that is transmitted back and forth. An example might be a Google search engine request for the capital city of New Jersey and the response would be “Trenton”. A firewall is a device that allows some traffic to enter your network while rejecting other traffic not specifically allowed or data traffic in response to your request. The challenge is to configure the firewall to allow only the traffic that you need for your work, and not to allow bad traffic, like unauthorized users, or traffic that contains programs that will secretly grab your passwords, or worse, grab control of your system or your entire network. Firewalls need to be updated regularly with updates that help it to identify new threats and protect against new vulnerabilities. Firewalls need to be monitored periodically to check for unauthorized access or attacks of your network. Many Firewalls can be configured to create and/or accept secure connections that are often referred to as Virtual Private Networks (VPN). When configured properly, these VPN connections allow safe and secure access to your network from a home office or while you are traveling. So what value is your information to others? If you use online banking, check your pension or medical information online, or use a username and password for anything, then you absolutely have information that others want. Those usernames and passwords give hackers access not only to information, but can give hackers access to other systems and other networks. It is important to understand that if your computer is compromised, it can be turned into a system that distributes software, movies, songs, photos, documents or other types of materials that are illegal to distribute. It might not be that obvious that you system has been compromised. Has your Internet connection slowed to a crawl? Have you noticed unusual charges on your bank statement? If you do not already have a Firewall, or are not sure, or have not checked its status or have no idea about what I am talking about, then you should contact a professional to help you determine what will work for your needs and fit your budget. If you do have and know what a Firewall is, then make sure its settings are still correct for your needs, it has been updated recently, and turn on and monitor logging to check the log files for suspicious activity. There are also services available for no-charge that will test your security. Just make sure that you select these carefully and they are from a reputable source. And above all else, do not give out any passwords or personal information to an unknown source. Contact Dolvin Consulting today to see how we can help with your security issues. Why consider a new ERP system?